BEST AND BEAUTIFUL ONET CONNECT GAME. 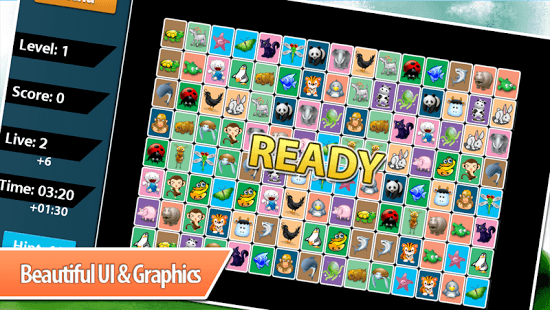 Onet connect animal is simple and addictive game, just like some others classic onet game, connect-2 puzzle / picachu pc game, but in this game, you can discover more quest and challenge, over 50 quest (mission) for you to play. ★ You have to find the pairs of the same image before out of time (or live). ★ The path between two images must have maximum of three lines. ★ Beautiful UI and nice graphics. ★ Simple control, touch to match two same animal to eat. ★ More than 50 mission and many quest in animal saga world. ★ Smooth animation effects and sound. ★ Perfect run on popular android and tablet device. Do you like to play others onet game or some others animal link game ? If it's, you will like this onet game for sure, this is one of the best onet animal link game on android. Enjoy it!! !